Will Public Works Miss Its Opportunity to Connect the Broadway Bikeway? Two protected bike lanes are in the works for the north and south ends of Broadway, in what could be a major breakthrough for creating a safe, connected bike network. But the Department of Public Works has no plans to link the two segments, leaving a nearly two-mile gap for the foreseeable future. The south section of Broadway and the north section, which becomes Brighton Boulevard, are both in line for protected bike lanes in the near future. But there are no plans to connect the two with a bikeway in the middle section. A continuous protected bike lane could make the Broadway-Lincoln corridor, known to many as the Spine of the City, the best biking route in Denver. With no gaps, this bikeway would link a burgeoning RiNo district with the popular locales of Baker and the destinations in between: the 20th & Welton Station, flagship museums, Coors Field, and the growing number of offices and homes. But City Hall has cited downtown traffic patterns, the possibility of future rail projects, and a lack of funds as barriers to even considering the connection. So imagine the jolt after pedaling safely along a glistening new protected bike lane only to get dumped into a cacophony of cars and trucks when it abruptly ends. That’s the plan for the north end of Broadway. When Brighton ends and becomes Broadway in RiNo, that will also be the end of a bikeway with sufficient protection to make most people feel safe cycling in the street. The missed opportunity stands out even more when you consider that another protected two-way bike lane [PDF] is in the works on Denver’s south side, this one on lower Broadway. It’s not set in stone, but the Broadway/Lincoln Corridor study should include a safe, protected bike lane along Broadway between I-25 and 14th Street — before abruptly ending at Civic Center Park. On Valentine’s Day, North and other bike advocates lovingly asked Mayor Michael Hancock to expand the study’s scope to include all of Broadway — “to unite the heart of Denver” — during a demonstration at City Hall. Since then, Mayor Hancock’s office said that planners will consider bicycle infrastructure on mid-Broadway during an update to the 2005 Denver Multimodal Access Plan, “which will establish a renewed transportation vision for downtown Denver in a coordinated manner.” That update will likely happen in 2016, so any tangible progress will likely take years. With two of three segments already in progress, why not integrate the final piece right away? One reason for the hesitation: Planners don’t want to lose momentum. DPW is pretty deep into the fully-funded planning process for the lower Broadway project, which has a simpler street pattern that allows for quicker action than the middle section of the corridor. Yet without a connection to upper Broadway, Denver’s spine will be dangerously disjointed. And some of the complexities on the north end are phantom problems — potential transit and traffic changes that aren’t in any plan right now but might someday be implemented to accommodate new intra-city rail service. There’s no reason a protected bikeway can’t co-exist with a future rail project many years from now, but inaction today could cost Denver in a very tangible way. If Mayor Hancock doesn’t intervene with a commitment to a continuous bikeway, Denver might squander its opportunity to build the centerpiece of a bike network that people of all ages and abilities can safely use to get from A to B. The growing appeal of cycling for transportation will lose out to the vague possibility of future conflicts. 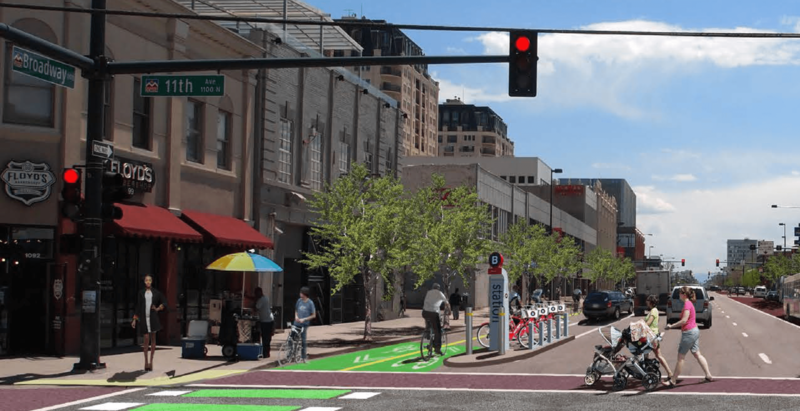 “Sure, planning a lane on north Broadway might be difficult, but I think that Denver’s at a place where we can take on difficult things and deal with them,” said Tom Wagner, infrastructure chair of the Denver Mayor’s Bicycle Advisory Committee. Wagner spoke for himself, not for the group, which makes recommendations on bike-related transportation matters. Figuring out how to extend a protected bike lane through the central section of Broadway doesn’t have to stall the lower Broadway project. As it stands, though, inaction is already standing in the way of progress. Not every street is going to get a dedicated bike lane, much less a protected one, so you just gotta deal with it – life ain’t fair! And this comes from someone who has ridden his bike for 35+ years, all over Denver, including the CBD. And no, I rarely attempt to use Broadway or Lincoln – Speer, Sherman and Bannock all offer far better options, with far fewer conflicts with vehicles.